In our day and age of consuming images and technology, a good photographer has never been more important. Not just that, the people behind the camera are even more important. As a creative and jeweler I come in contact with many photographers and I have an impressive roster of super talented friends that know how to capture just the right image. I’ve worked with the following individuals in different capacities, either for my jewelry brand or personally and they are each talented in a different way. Depending on the occasion, you want a photographer that knows how to set the scene or catch a certain pose and make sure you don’t have lipstick on your teeth! Aileen Devlin - Ya’ll know she is my go-to woman for all my incredible up close jewelry shots. And this badass isn’t afraid to tell you how to switch up the look or smile etc. Aileen and I have worked together since the inception of my business and I trust her completely. Oh AND Aileen now shoots videos! Sim Asher - We’ve also worked together since 2012, Sim has a great eye for scenic shots and infusing an image with additional moodiness. Sim also is creative in creating strange and dreamy shots. Courtney Kerr - My fellow momboss shoots family and solo portraits and she is so good at making you feel comfortable and at ease. Courtney shot our family images and I was so pleased with the naturalness of our pictures, ones we will treasure for a long time. Gigi Hoggard - This lady knows how to sprinkle magic dust on her shoots, she will make you into Snow White, a Viking or a Prince. Seriously, Gigi creates the most stunning and enchanting images with her editing skills. She is also ridiculously funny and entertaining. You will have a blast with her! Carley Page Summers - Carley is a triple threat, she styles, shoots and shops for your home and photos. Technically I didn’t work with Carley on a photoshoot BUT she styled one of my trunk shows and honestly, I don’t need to work with her to know this woman has MAD design and photo skills. You will be taken to a serene and calm world with Carley! It’s hard to decide my favorite Aileen Devlin image but this is in the top ten. Aileen Devlin takes immense care in setting up a shot. A mega skill of good photographers. Love this dreamy shot of Ashleigh in the woods by Sim Asher. Sim works his best in the outdoors, he makes any outdoors scene otherwordly. I am IN LOVE with the shots Courtney Kerr took of us. Look at how happy we are?! Courtney Kerr is such a pro, she helps relax a family by shooting in their habitat. Summoning all the magic with Gigi Hoggard, how wicked is this shot? Gigi is one of those people that will get down and dirty to capture the essence of her subjects. And she sprinkles that magic dust to make the shot GLOW! See the gorgeous blankets, plants and vibe? That’s Carley, literally in the background. As soon as I met Carley I felt all this stylish, elegance and fun vibes from her, and so will you. So that wraps this post on my favorite LOCAL Eastern North Carolina based photographers. There is so much talent in our region, which is why I post about it so much. Take this opportunity and book one of these awesome individuals because their calendars fill up fast! Confession time - I fancy myself fashion designing. When I was in early middle school, about twelve years old I dreamed of being on MTV House of Style or Fashion File - the big fashion shows on television. I would dream up weird yet artistic outfits. Once I sketched a harlequin ensemble! It was super cheesy but interesting. Local college students, business owners and more were models for the event. We even had them walk down the street to promote the event. So it’s no surprise that I finally lived out part of that dream in working on a jewelry and fashion show with my good friend Paula Chrismon. 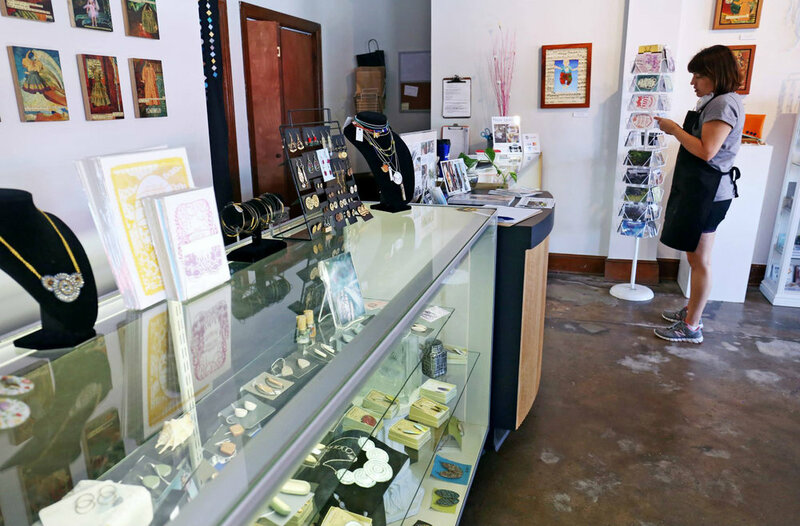 At the time, five years ago Paula owned a consignment boutique in Uptown Greenville and I had my studio at Art Avenue. 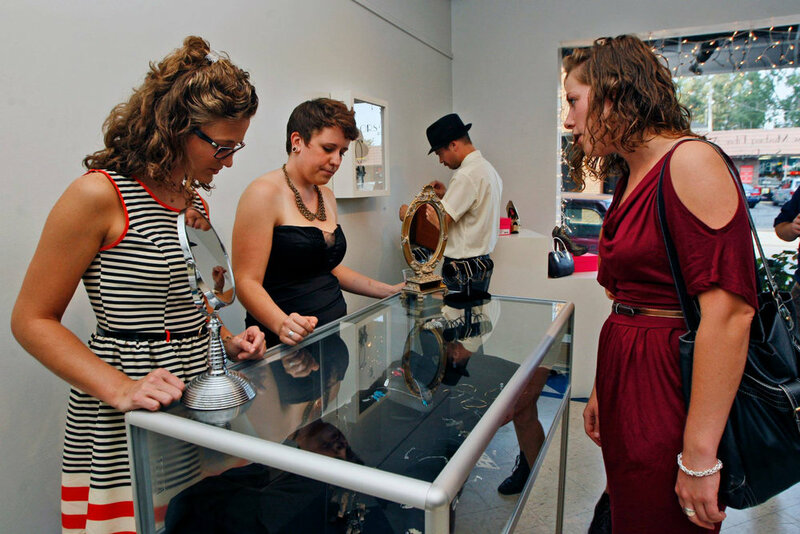 And I loved the idea of merging the two, consignment fashion with art jewelry. Paula provided the clothing and shoes, while I worked with some of my art jeweler friends to provide the mega jewels. And all of the clothing and jewelry would be black and gold. Hence the name Aurelian (translates to Golden). We worked it out that we secured sponsorships from local business’ at three monetary levels, $50, $75 and $100 this was able to pay for our lookbook, video, food and signage. It was probably one of the most ambitious and gratifying projects I’ve ever worked on. We were able to generate so much interest and attendance in the show that we were bursting at the seems, and mind you we didn’t charge an entrance fee for the event. We even made a video, for which I’m so proud and happy we did. The video combined our love of fashion and production. You can watch it below. Me with my friend Gabi. The show was the talk of the town. Danielle James necklace - how amazing and cool is the way she created a brick window into a necklace? 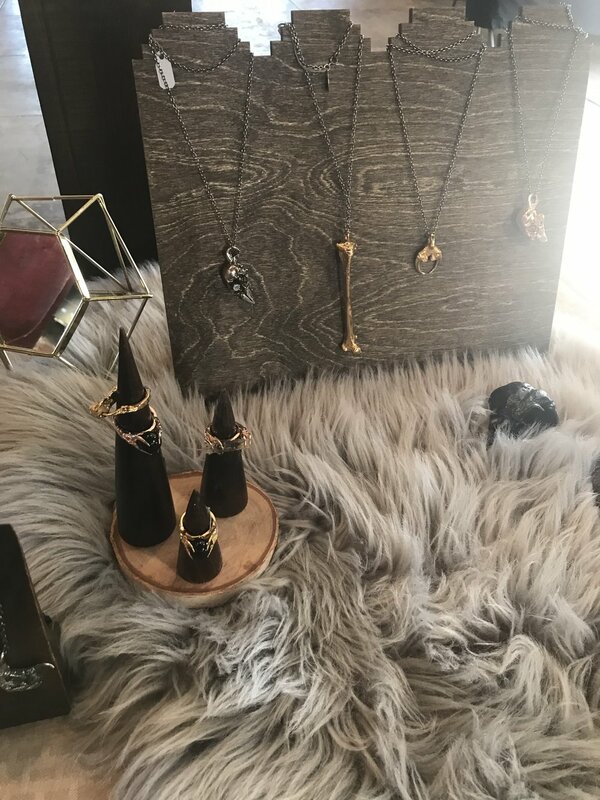 I enlisted my friends to sell and promote the jewelry. When I recall this amazing event Paula and I put together I’m struck by how much I loved working with my friends and community in showcasing local talent. Granted it was alot of work however the fashion show elevated the status of consignment fashion and art jewelry. I think it’s so important to remove the curtain in a sense of art, to show it as everyday. I’m hoping that I can work with other talented individuals in my new town of Farmville. What I’ve learned over the years is that when I work with others it makes a project not only more fun and enjoyable but also it creates alliances and new relationships that didn’t exist previously and those relationships carry over into future collaborations. As always, thank you for reading and you can learn more about my projects and events below. My Galentine’s Day Gift guide is here! I curated this selection to truly match the special woman/man in your life. I’m not talking about your spouse or partner but the person that you call in the middle of the night or when you need to vent and cry your eyes out to. Here I am with my dearest friend Cate. I’d be lost without her in my life! Of course, I do consider all of my jewelry perfect gifts for any occasion, but these selections speak to any price point $30 to under $200 and to the type of person in your life. I hope this helps and lets lift up the amazing souls that do the same for us! Are you scrambling for presents last minute? I know I’m still searching for the perfect gift for several people in my life. So here’s a quick list of my items under $100 because that’s reasonable but also generous to your loved one. The delicate yet interesting shape of the bird bone make them perfect as a gift. I’ve already given these sweet pairings as gifts - the bird bone ring or bracelet and my friends love it! The bird bone bracelet was cast from a sparrow bird bone and it’s so light and great for layering. The bracelets start at $55 and go to $135 plus you can also get them in a set with the bird bone rings. These make purrrfect stocking stuffers or a sweet gift for the cat lover in your life. These were cast from the claws of my cat Stevie. Cats shed their claws and when I found hers on the floor I had a Eureka moment! I love wearing these as extra studs to my larger more statement making earrings. These are just as dainty and fierce as the cat claw but with more length. I love wearing these higher up on my ear. They make fantastic gifts for the bird lover in your life. Some say they look like dragon talons. As with all Eilisain Jewelry orders this holiday season your order will arrive with a complimentary polishing cloth and special gift. This holiday season take the time to order from someone local and a gift that is handmade. Trust me when I say your recipient will truly appreciate the craftsmanship and quality. Not only is the holiday season about giving it’s also about the parties and celebrations. As a self proclaimed fashionista (tho less so now that I’m a SAHM/WFHM - stay at home mom and work from home mom) I LOVE holiday parties. There is something to be said about putting on a glitzy dress/outfit with all the jewels and decking the halls with your friends and family. It’s magical, fun and wonderful. How gorgeous is this whole outfit, down to the perfume. 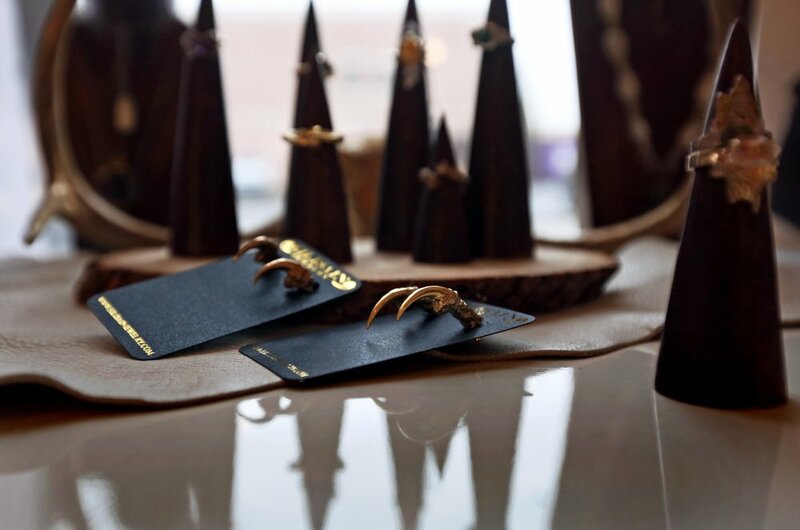 And when you’ve got The Hunted triple crow claw ring on EVERYONE will notice your hand and selection of jewelry. 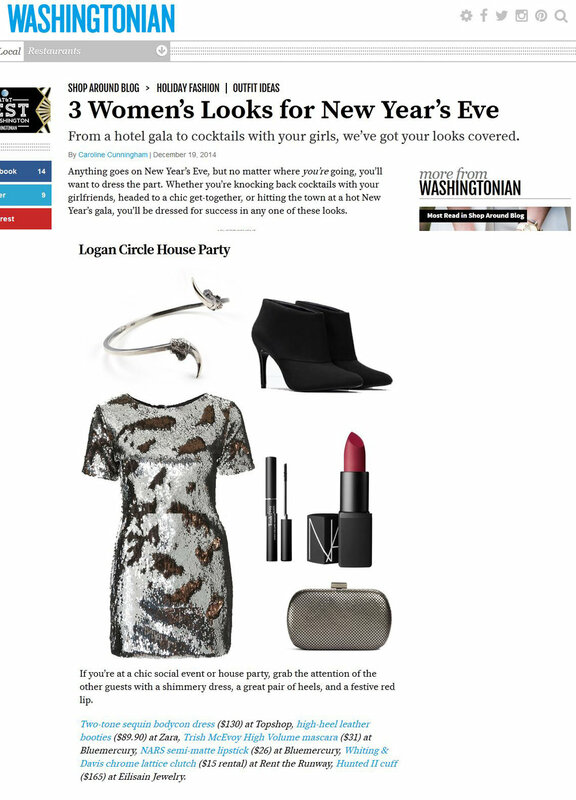 As a former DC/VA resident I was so smitten they chose the Hunted II owl talon cuff with this badass outfit! Okay this isn’t necessarily a holiday outfit BUT it is great for lounging around with the family or when you meet up with friends for casual drinks. This holiday season, whether you’re going out to the theater or to a holiday work party, dress up your outfit with jewelry. Jewelry ALWAYS amps up your outfit. This video popped up on my feed and it brought back some fun memories of showing my friend Natalie Saywich, Greenville Reflector reporter, how to make a simple ring band. Natalie did a series with Mixer magazine (a companion to the newspaper) on teaching her how to do jobs around Greenville. Creating a simple ring band is one of my favorite demos and ways to show people how to create jewelry while also getting to work with the torch, which most people love. What I love about Durham? Handmade and local! I'm SO SO excited to be returning to Durham this coming Sunday, 12-5pm, for the summer Patchwork Market show!! 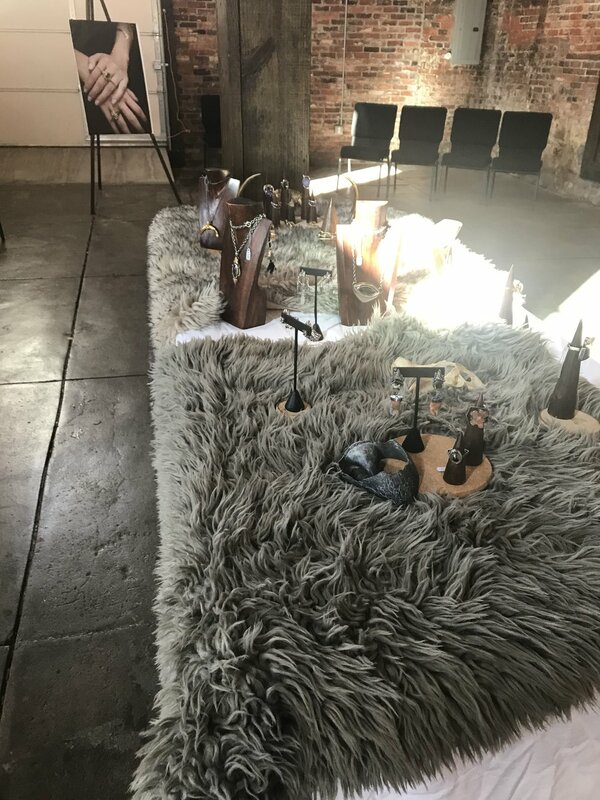 It's been several months since I've done a show and I really miss being out and about meeting people and sharing my love of handmade and jewelry. If you've never been to a craft show or more specifically a handmade craft show (there are so many variations of types of craft shows) BUT they are so much fun. The quality and craftmanship you get from handmade objects and jewelry are WAY better than what you get at the mall. As a SAHM (stay at home mom) I get a bit lonely - as much as I love playing with my sweet girl, I crave being social. Thus show time is a serious joy for me. Plus I get to catch up with my fellow makers and bossbabes! AND I get to shop handmade as well, seriously I do most of my gift shopping at the shows I participate in, because it is pretty amazing to connect with the person that hand makes your favorite mug, handbag, tshirt, print, jewelry and more. Now if you can't make it to the Durham Patchwork market you can always still shop with me online - wink, wink. Because honestly my best pieces usually sell at these shows. Also check out my post on my 5 Eastern North Carolina Artists and Makers you should follow. My friend River of Rivtak is featured and she will also be selling at the Patchwork Market. The Holiday gift guide is here! I'm seriously baffled at how quickly the holidays arrived....AND that it's time to get those holiday gifts. I put together a short and sweet guide of some of my best sellers and new pieces to add to your holiday gift inventory. Black Friday - November 24th - ONE DAY ONLY - 40% off EVERYTHING. But you've got to be on my email list to get the code. 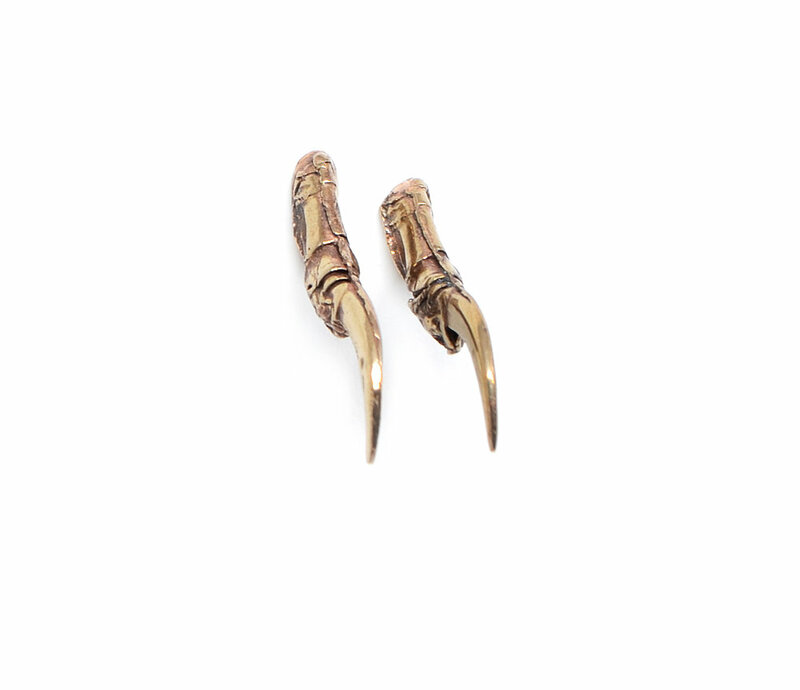 Small Business Saturday or CATurday - FREE pair of bronze cat claw earrings with any purchase over $100. These make purrrfect stocking stuffers. One last thing - THANK YOU for shopping handmade and local this holiday season, you are pretty much helping your neighbor and community. More revenue goes back into your hometown with dollars that are spent on local business. Can you believe it, the holidays are nearly here, in my head they are already here! I'm in holiday show prep mode but I'm also thinking - I've got to get my holiday gifts in order. With that said, I'm sure you're also planning gifts and we all need a bit of help and advice when it comes to jewelry especially as a gift. So here are my tips for purchasing for a loved one. 1. When in doubt, buy a necklace - Why? Because you don't need any sort of measurements (except for maybe chain length) but really a necklace is super easy and one that most people love. 2. Observe what kind of metal they like - Some people are strictly gold or silver and some love both. Pay attention to what they wear on a daily basis then pick your metal. 3. Order three to four weeks ahead of the holidays - As you know we're all in prep mode so it can take a bit longer to get your orders out the door and in your loved ones hands. 4. Gems catch the eye - Who doesn't love bling? If you can purchase a piece with some stones or ones that are their birthstone, this is usually a big hit with women. 5. Know the gift receipts and exchange policies - Most jewelers do not offer returns, especially small business BUT you can usually get a gift receipt or exchange receipt just in case your recipient isn't completely happy. I hope these tips help you this holiday season and if you have any questions or additional tips - let me know! And here's your chance to get some holiday shopping done now - click the button below. For some reason it's really hit me over the past several weeks how overwhelming it's become to be a stay at home mom/working mom/part time worker. Maybe it's because Tallulah is now 5 months old and we're reaching the age where she's really becoming a person, aka laughing, smiling, babbling and almost eating real food. I lay in bed at night mulling over my business, how to be creative and make it all work. I know, it is a bit unrealistic to 'make it all work' because really it won't ever be perfect. And I can't have one part of my life be fantastic without one chunk of it taking a hit. Tallulah and I on a mommy and me lunch date. She was about three months old. And I want to share this with you because I want to be transparent and also provide some background as to why it's taking me SO long to get new designs and pieces on the website. I also know that as a consumer myself, I like seeing new and fresh ideas come from the makers and people I support as well. I'm slowly learning how to schedule my free time, with sketching, creating, organizing my studio and workspace along with finishing custom orders, regular orders AND the upcoming holiday show schedule. I volley between feeling completely overwhelmed and lost to determination and resolve to prioritize my time. What usually ends up throwing my confidence is when I do the comparison game, and knowing that there is SO much that I want to improve with my business. Then my mind spirals into an abyss of all the tasks I want to accomplish. So here it is folks - it's going to take me time and understanding to get to a place that flows. In the end I have to say that I'm incredibly blessed with a supportive family and worklife that allows me to spend time with my daughter as well as run a business that I love. Last week, as I sat at my desk journaling these exact same feelings a giant swell of emotion came over me - I am doing what I love, what I envisioned close to twenty years ago when I was only dreaming of becoming a creative person. And I knew in that instant that I am willing to fight and work incredibly hard to keep my dream alive. It may sounds cheesy but in this current world where many individuals feel helpless or unworthy, one can not take for granted the opportunity to do what you love. I hope that this post gives you encouragement to follow your own dreams, because it is worth it. Allow yourself to dream to incredible heights with limitless possibilities. It is what gives the rest of us hope and light. thank you for dreaming and allowing me to dream!